Welcome to Digital Frames Direct, the UK’s largest and oldest retailer of Digital Photo Frames, Advertising Displays and Point of Sale Displays. 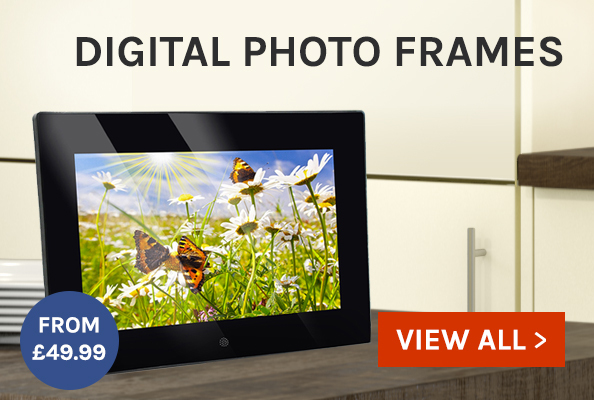 We are the leading retailer of Digital Frames and offer the biggest product range both online and offline. Because of this you can guarantee we will have the perfect frame to suit your needs, whether that may be to display family photos and memories or advertising new products and services. Furthermore, we are proud to offer fully customised and branded digital photo frames that create a unique corporate gift for your customers. We also supply specialised Point of Sale solutions including freestanding display units as well as both floor mounted and wall mounted solutions. All products are supplied with a free 12 month warranty, we also offer a dead pixel guarantee promise giving you complete peace of mind should you choose to place an order with ourselves. Should you place an order with Digital Frames Direct we offer a 14 day return period if you choose not to keep your product. A wide range of delivery options are available and as advertised we offer free delivery on all products to most of the UK addresses with an option to upgrade your delivery to an express, next working day service for just £5.95! We have always offered the largest range of Digital Photo Frames in the UK and have a huge offering of sizes with numerous models in 7”, 8”, 10”, 12”, 15”, 19”, 20” and 21.5” so you can guarantee you will not find a better digital frame elsewhere. Our smaller Digital Frames are designed for a range of uses from Home, Advertising and Corporate gifts whereas our large digital photo frames are designed for commercial use. Digital Frames Direct will help you meet any requirement that you have for our frames and can accommodate any request even if he product is not available off the shelf. We are very proud to have worked with and supplied our products to some of the largest companies and business around the world to help increase their brand identity. On our website you can find a huge range of previous work that we have done for companies such as: Google, Orange, Vodafone, Samsung, Suzuki, Peugeot, Harley Davidson, Nintendo and Mercedes and many more big name brands. If you are looking for something a bit bigger then we still have a solution for you! We offer an extensive range of gorgeous Digital Advertising Displays and Digital Posters perfect for presenting in public spaces or corporate and commercial environments such as exhibitions, shows, events, supermarkets and more. These displays are perfect for almost any environment coming in a whole host of shapes and sizes from 15” all the way up to a huge 82” and will look absolutely stunning when promoting new products, services or simply just looking to entertain. The range of Digital Advertising Displays on offer cover any size you may need and are available in freestanding, floor mounted and wall mounted options. This range includes simple HD screens, high brightness displays, touch screen monitors and video wall displays so we will have the product to accommodate your needs. So pleased with my new digital frame. Got it for my wife for part of her birthday present. Put some pictures of us on it from the honeymoon! The service was outstanding. Recommend! Extremely happy with the fast delivery and great service I received when buying a frame from you! It came exactly when it said it would and the quality is superb, thanks! Got this frame for my mum for Mother’s Day. Filled it will photos of all the family and she loves it! Delivery was fast and the frame is of fantastic quality! Couldn’t be happier. You will see in Suzuki GB dealerships around the United Kingdom that Digital Frames Direct are proud to supply each dealership with a digital advertising display. Suzuki came to us due to our experience and knowledge in successfully promoting new items through digital advertising. Suzuki were shown on the different options available to them and the benefits from these products and decided on our 19" Memory View large Digital Photo Frame each with its very own floor standing display. Each unit was supplied pre-loaded with a unique offer for each dealership advertising the many new vehicles and service options available from Suzuki GB. This highly successful campaign is a brilliant solution for catching each and every customers attention. 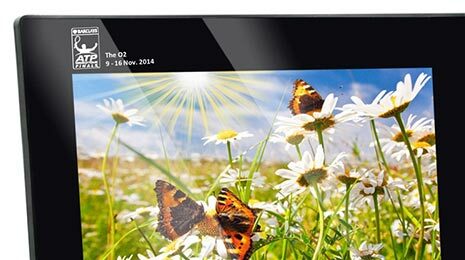 Digital Frames Direct are proud to have supplied Samsung with a large number of our 19" Digital Photo Frames. We were approached by Samsung who were looking to source large digital advertising displays to promote their brand new range of Digital Cameras. 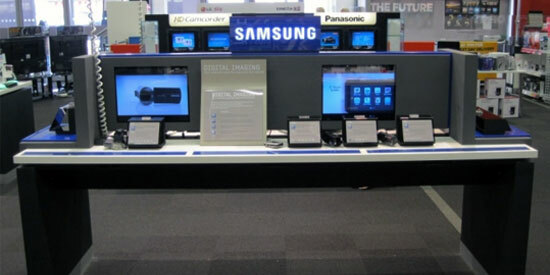 After viewing a number of different options they decided to purchase our 19" Memory View Digital Photo Frame to build into an in-store display module which can now be found succesfully helping Samsung sell their new range of electronics in PC World stores across the United Kingdom. Digital Frames Direct are incredibly proud to have worked closely with Peugeot & Citroen to provide a number of our Digital Photo Frames to be branded with their company logo. With a huge range of options available to them and with the help of our expert sales team Peugeot decided on the Living Images 12" Slimline Digital Photo Frame. This stylish, modern looking Photo Frame was then branded using a screen printing process to apply the Peugeot logo onto the surround of the unit creating a fantastic customised Digital Photo Frame. Mercedes Benz is another valued customer of Digital Frames Direct. You will see our 12” Slimline Digital Frames with our floor stands across the UK in Mercedes Benz dealerships. The frames were custom loaded with a promotional Mercedes Benz video which runs perfectly on our promotional frame. 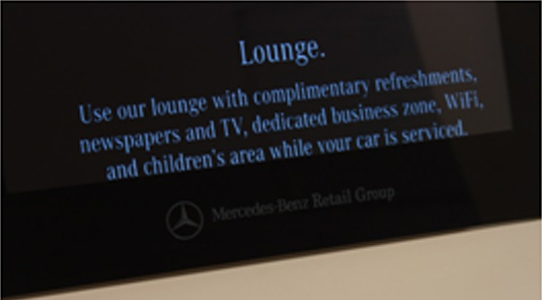 Mercedes Benz is a returning customer and has taken also taken our 7” Lumina Digital Frame. These Mercedes frames were all preloaded and branded by us so all they needed to do was plug in and play the frames. Digital Advertising is a great and effective way to promote business. Here at Digital Frames Direct we are able to offer branded and bespoke frames, from a branded wake up screen to the branded packaging we can completely customise our digital frames for any business. The National Trust has been a fantastic and highly revered customer of ours for the past few years now with orders ranging from our 10.1” models right up to the 21.5” Memory View. Perhaps our proudest order from them was the printed 21.5” Memory View which was branded with their logo and supplied with a floor stand to boot. The frame looks fantastic and was really simple to design and implement. Within one week of being approached by the National Trust, we had the frame being printed, and a short while after, the frame was in place on site. 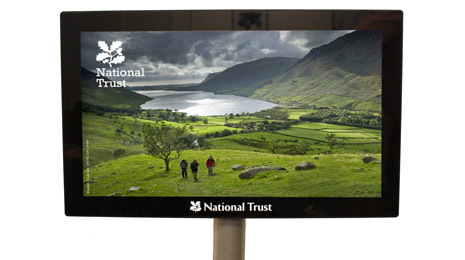 The plug and play nature of the frame means that instantly, the frame can be shown off to visitors of the National Trust’s many sites across the country. Barclays ATP World Tennis Tour have recently purchased a number of our 10.1” Super Clear Digital Frames to hand out as corporate gifts at the tour. They were drawn to our website as the market leader in branded corporate Digital Frames. We were quickly able to speak with them and gauge their requirements and identify the perfect frame for their requirement within their budget. We were able to turn around the printing process and delivery date within a matter of working days to ensure we accommodated for their narrow time scale. The frames look stunning with the branded ATP World Tour logo and date of the event, creating the perfect corporate gift that the client will never forget. With a huge range of frame sizes and branding options we are certain to be able to meet any customer requirements. We have another satisfied customer and we are delighted to add ATP World Tours to our ever growing portfolio.